With the D-D Reef-Pro aquariums decades of continuous improvements have been incorporated into the maker's version of the 'perfect system', affordable and suitable for both beginners or advanced aquarists. 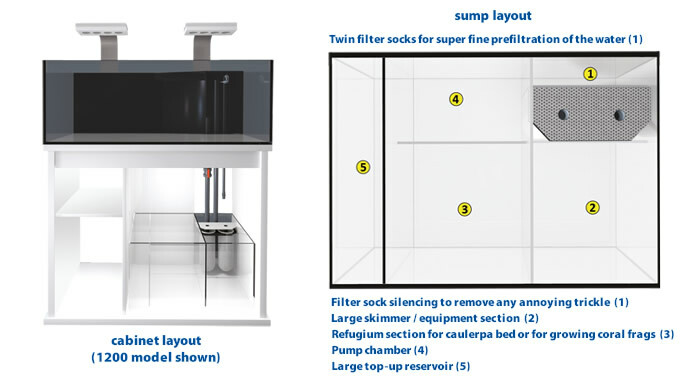 A rimless iron glass tank, twin filter socks and filter silencing.... silent invisible weir and overflow arrangement - to name just a few of the new D-D Reef-Pro systemised aquarium's features. Built with the advanced hobbyist firmly in mind, the system has been developed to perfection with a flawless, clean aesthetic that runs throughout the entire design, reflecting the brand's extraordinary expertise. The layout of the aquarium has undergone some careful consideration to provide the consumer with exceptional functionality whilst also offering maximum space, hiding equipment such as the weir box to minimise intrusion into the aquarium. The weir consists of an elegant twin stand pipe design to offer silent running and a dry box section which allows the piping to run through the aquarium rather than down the back of the display. The weir box has also been cleverly angled so as to reduce dead spots within the tank, with pump pipework that maintains a clean and tidy look. The sophistication of the ultra-quiet twin pipe weir system does not stop there. With further refinement at the sump level, the pipes are completely submerged for silent water return, not to mention the eradicating of gurgling and splashing. But the filtered water also flows into two large compartments that have been specifically engineered to hold additional equipment, as well as the choice to use one chamber as a refugium with caulerpa/cheato. This section provides further flexibility for those aquarium owners who prefer to skim before the refugium, or those who prefer to skim afterwards. 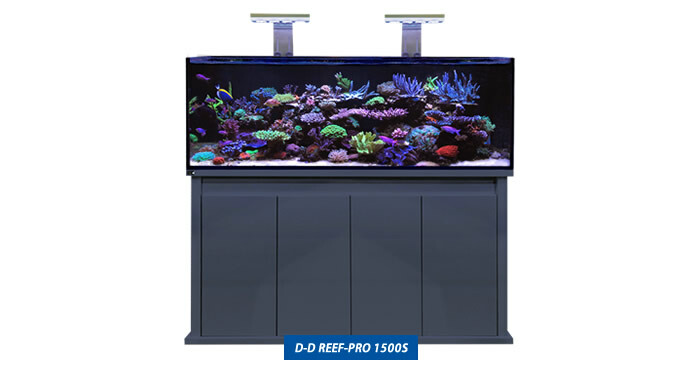 The D-D Reef-Pro aquariums have been designed to allow the aquarium hobbyist the flexibility to customise and improve their tank system with equipment of their choice as they do not come with any electrical equipment such as lighting, pumps or skimmer etc. 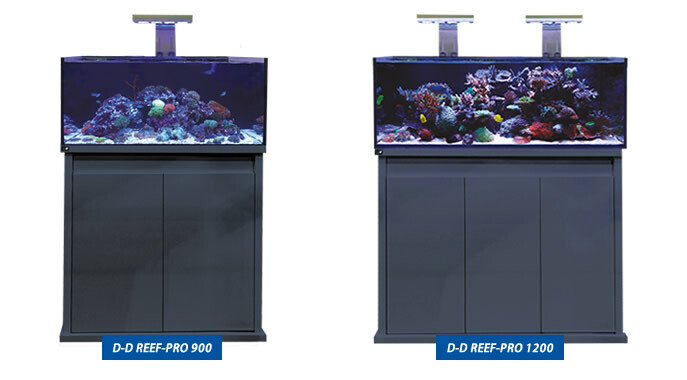 To finish the elegant look of the D-D Reef-Pro aquariums, the tall profile of the tank and cabinet only adds to its appeal, allowing for good headspace whilst carrying out all types of maintenance work. 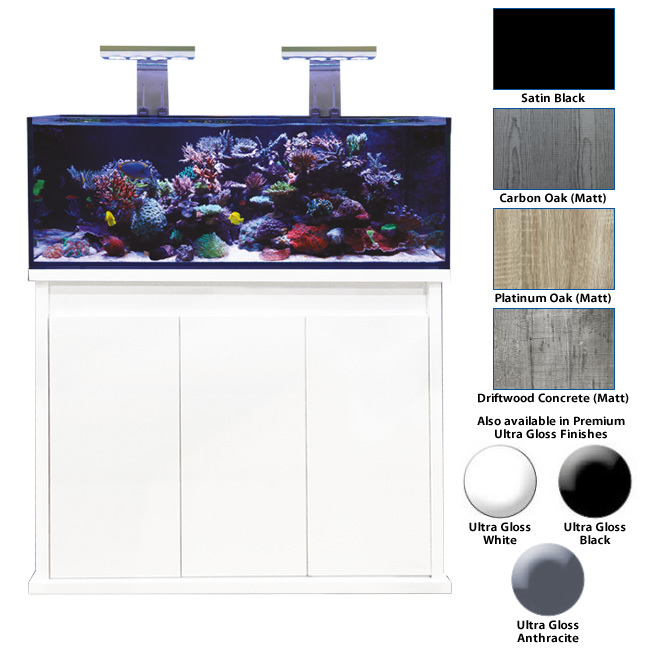 The aquarium cabinet is supplied pre-assembled and provides excellent rigidity and loadbearing, courtesy of its 36mm waterproof boarding and heavy duty adjustable feet. The cabinet also showcases a double fold back door and soft close hinges for optimum convenience and improved access.